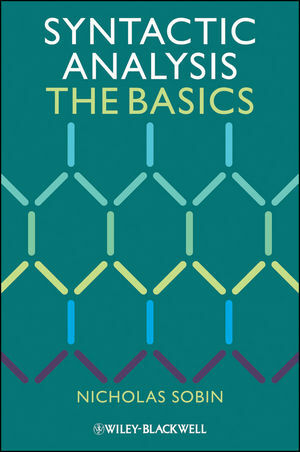 Highly readable and eminently practical, Syntactic Analysis: The Basics focuses on bringing students with little background in linguistics up to speed on how modern syntactic analysis works. Nicholas Sobin is Professor of Language and Linguistics at The University of Texas at El Paso. He has published numerous articles on various topics in syntax in such journals as Linguistics Inquiry, Natural Language & Linguistic Theory, and the Journal of Linguistics, and has held Visiting Scholar appointments at M.I.T. and Harvard University. He is Professor Emeritus at the University of Arkansas, Little Rock. This chapter introduces hypothesis formation and testing in the realm of human language and discusses the paradox of language acquisition. It offers an initial sketch of the Principles&Parameters approach and the innateness hypothesis. Words are analyzed into roots and affixes. A system of generative word formation is introduced involving morphemes and word formation rules. Also discussed are criteria for identifying the lexical class of roots, stems, and words. Finally, a discussion of the “meaning” of particular affixes leads to the conclusion that affixes do not have “simple” meanings, but instead participate with a constellation of other factors to determine meaning, something referred to as “compositional” semantics. Tests of phrasehood are introduced, indicating the presence of hierarchic structure within sentences. Also presented is some of the core terminology of syntactic relations among phrases. Presented here is the system of determining grammatical function (subject, object, or adjunct) based on structural position. Building on this, theta roles and argument structure are introduced, offering an explanation both of how arguments (subjects, objects, etc.) get their explicit meanings, and how verbs “choose” the correct complementation pattern. Here, the notion of “category-neutral” processes is first introduced, paving the way for the generally category-neutral system of X-bar syntax presented later. The processes discussed here are coordination and proform insertion. This chapter introduces c-command and some of the phenomena that ccommand has been crucial for explaining, including the distribution of negative polarity items, and the Binding Principles, the distribution and semantics of anaphors and pronominals, and referring expressions. The presence of such mechanisms as the Binding Principles in the theory of syntax points offers further support for the innateness hypothesis. The case is made here that auxiliary verbs each head a VP, so that sentences with multiple verbs involve a recursive VP architecture. Also, the first transformation, Affix Hopping, is introduced, opening the discussion of transformational grammar, and the levels deep structure and surface structure. Arguments are advanced that phrases headed by themajor lexical categories NP, VP, AjP, and PP share the same internal architecture, pointing toward the conclusion that the rules of the syntactic system are category-neutral rather than category-specific – instead of having separate rules for NP or VP, a single, general rule set explains the internal architecture of all major phrase types. The category-neutral analysis is extended here to functional categories such as T and C, leading to the conclusion that the system of syntax is completely category-neutral. The rules of syntax are few and simple. The specific details of derivations are largely driven by the features and argument structure of the words/morphemes employed in the derivation. The concept of parameter setting is developed further. composed of series of “short” moves. The WH Island Effect is introduced in connection with this discussion. The syntactic system is argued to be “constructionless”, since its rules apply broadly, across different construction types. Arguments are advanced for the VP-internal subject hypothesis, the idea that the subject of a sentence originates low, in SpecVP, rather than in its higher surface position, SpecTP. This indicates the existence of a rule,NP movement, which searches for an NP low in the structure to fill the SpecTP position. This leads easily into the analysis of passive sentences, where no subject appears in SpecVP (due to theta role suppression), so that Move NP must find another (non-subject) argument to fill the SpecTP position. NP movement is also central to explaining subject-to-subject-raising constructions, where a higher clause may “steal” the subject of a lower clause. Like WH movement, NP movement participates in deriving a range of constructions, supporting further the view that the syntactic system is both category-neutral and construction-neutral. Here, three further significant aspects of syntactic analysis are sketched out, anticipating further studies in syntax. These include the unaccusative hypothesis (the idea that the subject of certain apparently intransitive verbs actually starts as an object), theVP shell hypothesis (the idea thatmultiple complements are not “flat” but involve asymmetrical c-command), and the DP hypothesis (the theory that “traditional” NPs are in fact DPs, phrases headed by the functional category D).